We have prepared with the Eye Bank Association of America a brochure on Coding and Reimbursement of corneal tissue used for transplant. Cornea acquisition fees are billed to insurance companies in a particular manner to ensure reimbursement. Please down load the attached brochure to help understand the special procedure toe ensure that your facility receives 100% reimbursement. The Centers for Medicare and Medicaid Services (CMS) treats eye bank tissue processing fees for keratoplasty as a “pass through” expense paid at the invoice price for the transplant facility using HCPCS code V2785. CMS makes separate payments for the acquisition of corneal tissue for use in corneal transplant and glaucoma shunt procedures. However, there has been some confusion about this policy, which has led to instances in which the tissue was billed incorrectly, and thus not reimbursed by CMS. 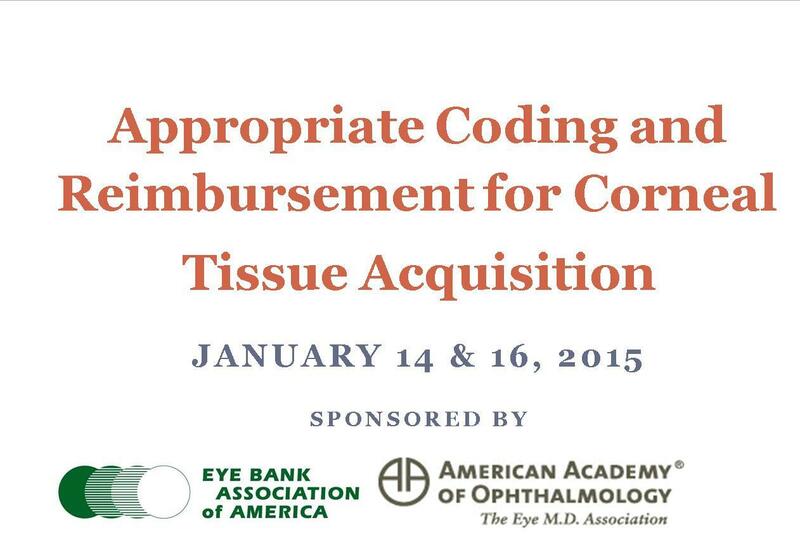 These resources were developed by EBAA and AAO to help you secure the reimbursement to which you are entitled by CMS. EBAA and AAO hosted a series of webinars for eye bankers and physicians to explain the policy in more detail and to answer their members’ questions. The slide deck and recordings of these calls are below.